Incoming emails are processed only if you keep the application open. As soon as you close Email Parser email processing will stop and to resume it you need to open Email Parser again. Incoming email processing will take place in your computer but in the background. You can close the application and emails will be still processed as usual. 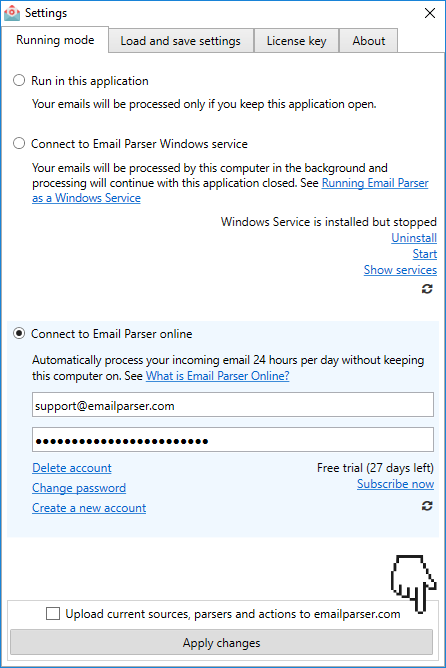 The Email Parser Windows service is a separate process that is started when you turn on the computer (as most Windows services). See Running Email Parser as a Windows service for more information. Use this mode if you want email processing to happen without keeping your computer switched on. Your email sources, parsers and actions will be stored and run in the EmailParser.com servers. See What is Email Parser Online for more details.